In between the sea and the plains of Bengal, on the easternmost coast of India, lies an immense archipelago of islands. Some of these islands are vast and some no larger than sandbars; some have lasted through recorded history while others have just washed into being. These are the Sundarbans - the beautiful lands. Here there are no borders to divide fresh water from salt, river from sea, even land from water. The tides reach more than two hundred miles inland, and every day thousands of acres of mangrove forest disappear only to re-emerge hours later. For hundreds of years, only the truly dispossessed and the hopeless dreamers of the world have braved the man eaters and the crocodiles who rule there, to eke a precarious existence from the unyielding mud. The settlers of the Sundarbans believe that anyone who dares venture into the vast watery labyrinth without a pure heart, will never return. It is the arrival of Piyali Roy, of Indian parentage but stubbornly American, and Kanai Dutt, a sophisticated Delhi businessman, that disturbs the delicate balance of settlement life and sets in motion a fateful cataclysm. Kanai has come to visit his widowed aunt and to review some writings left behind by her husband, a political radical who died mysteriously in the aftermath of a local uprising. He meets Piya on the train from Calcutta and learns she has come to the Sundarbans in search of a rare species of river dolphin. When she hires Fokir, an illiterate, yet proud local fisherman to guide her through the mazelike backwaters, Kanai becomes her translator. From this moment, the tide begins to turn. Amitav Ghosh has discovered yet another new territory, summoning a singular place from its history, language and myth and bringing it to life. Yet the achievement of The Hungry Tide is in its exploration of a far darker and more unknowable jungle, the human heart. It is a novel that asks at every turn: what danger resides there, and what delusion? What man can take the true measure of another? 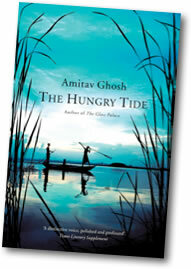 The Hungry Tide is a whirlwind work of the imagination, every bit as epic in scope and ambition as his beloved and bestselling work, The Glass Palace.